Riot police in Chile have deployed water cannons and tear gas against demonstrators who were lobbing rocks and street signs, after a mostly-peaceful march against a contentious university reform and corruption allegations ended in violent clashes. Organizers say that 150,000 students filled the streets of Santiago on Thursday to demand free higher education, and challenge Socialist party president Michelle Bachelet over recent corruption allegations. Authorities estimated the number to have stood at around 20,000 people. As the peaceful march, organized mostly by opposition parties, came to a close, a smaller group of radical protesters began to attack and pelt objects at the armed police, reportedly injuring one officer. Riot police pushed back, using water cannon and tear gas, as demonstrators banged on the windows of armored vans. At least four protesters were detained. 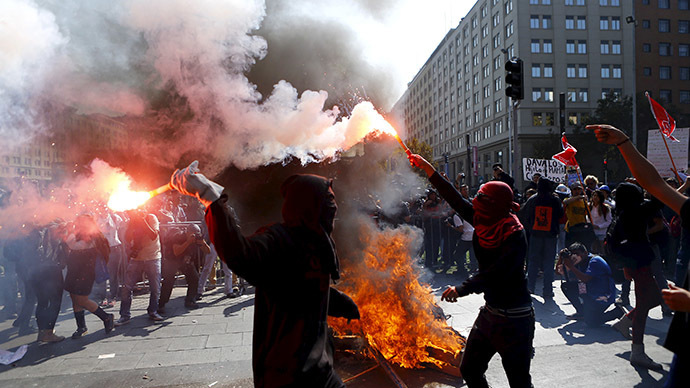 Education protests reignited in the wake of President Bachelet’s promise to abolish the country’s high university fees. A series of tax raises that have brought $8.3 billion for that purpose last year. However, the majority of the funds have been allocated to other programs. “It is not clear whether the high expectations of students will be fulfilled. The money from the tax reform originally committed for education won’t be enough to finance all the reforms,” Diego Vela, one of the organizers told Bloomberg. Bachelet was elected for the second time last year, after losing her post in 2010. She recently became embroiled in the scandal after her son’s wife was reported to have obtained a $10 million loan under suspicious circumstances. A separate scandal involving right-wing politicians and SQM, a mining company that meddled in politics and was able to avoid taxes, led to students occupying its headquarters on Wednesday, as well as calls for punishment during Wednesday’s march. “We need to protest against this caste of corrupt politicians and businessmen who are involved and who are not ruling for a majority, and instead they're cooking up the reforms behind four walls,” Aurora Isidor, who led a procession of high school students, told AP. Chile has one of the most unequal education systems in the world; a legacy of the Pinochet era. While those who are able to afford private education receive access to some of the best facilities on the continent, those who are not, are allocated limited funds, and are left behind.